I finally took the time to get rid of Time Warner cable and I couldn’t be happier. I’ve been a Time Warner cable and Internet customer for many long, expensive years. I’ve always thought their prices for cable TV were exorbitant, but I didn’t want to take the time to look for something different. But after having to call them once a year for the past five years to complain about the ever higher rates on my cable bill, I finally got fed up and turned in my cable box. I knew I wasn’t interested in satellite TV. I’ve known a lot of people who don’t like the way their screens pixelate and freeze when it’s cloudy and rainy outside. Up until recently, I wasn’t aware that you can get free digital TV channels just by putting up an antenna. I kept thinking these antenna’s were like the old fashioned ones people used to put on their roof before cable TV came out and how snowy TV reception sometimes was in those days. I did a bit of research and finally decided to purchase a Clear Stream antenna from Best Buy. It cost $149.00. I also had to purchase a booster. The one I bought cost $69.00. The purpose of the booster is to increase the strength of the signal coming to the antenna. Mine was made by Motorola but there are several brands to choose from. I also had to buy coaxial cable. You have to have enough cable to run from the antenna through the wall and to the back of each TV on which you want to get the free channels. As I live in a condo, I couldn’t put my antenna on the roof but I found out it works just as well in the attic of a home or condo. So I put the antenna together using the instructions provided in the box and then I mounted it in the attic to the rafters. I went to tvfool.com and put in my zip code and this shows you all of the channels available in your area and the direction to point the antenna so you can receive these channels. I used an app on my phone as a compass to know which way to point the antenna. The hard part of the installation was trying to fish coaxial cable from the attic inside the wall and through the wall to the back of the TV in each room. I wanted TV in three rooms so this process was quite lengthy. But worth it! When the installation was complete, I turned on the TV, set the input to antenna, and then scanned for channels. 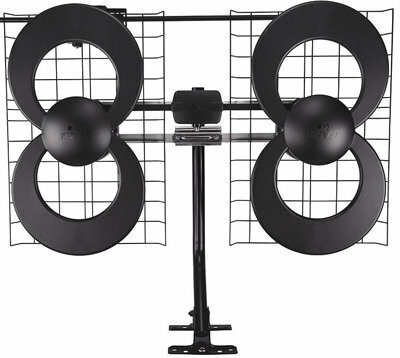 If the antenna is pointed correctly, the channels will automatically be added. I was pleasantly surprised to find that I get clear, digital reception on 15 channels, and best of all the major networks are in high definition. The channels you receive vary depending on where you live, but following is a list of the channels in my area. If you aren’t a DIY person, you can Google OTA (over the air) antenna installers in your area and pay an expert to do it. If you have a smart TV or a Roku box you can also add Netflix, Amazon, Sling, Hulu, Play Station Vue, and many other apps and stream an almost unlimited number of TV stations and movies. You pay for these apps but the channels that come in through your antenna are absolutely free! I still pay $39.00 per month for Internet access, and I also have a Roku box through which I steam movies that I pay to rent, but my cable bill is a fraction of what it was before.